If you are looking for something natural, here is herbal vitiligo treatment known as Herba-Care Viticare. Worried by skin pigmentation problems? Skin pigmentation is a common problem and there is no woman on this earth who isn’t aware of this condition. Skin pigmentations can be temporary and for some it may leave permanent patches on their body. This is actually an annoying condition as it may cause lose of self confidence and low self esteem. Vitiligo is a condition where the skin loses its color in blotches. These are evident as white patches across certain areas of the body. It is not a contagious disease and not a life threatening problem. There is no particular cure but there are remedies that can help to improve the appearance of the affected areas. There are hundreds of remedies and natural products available. When you search on the internet about this the main natural remedy you can find is papaya juice and papaya packs. This article is all about herbal treatment for vitiligo – Herba-Care Viticare. Viticare is an herbal formulation that comes in 5.7 OZ bottles loaded with essential oils and natural extracts. 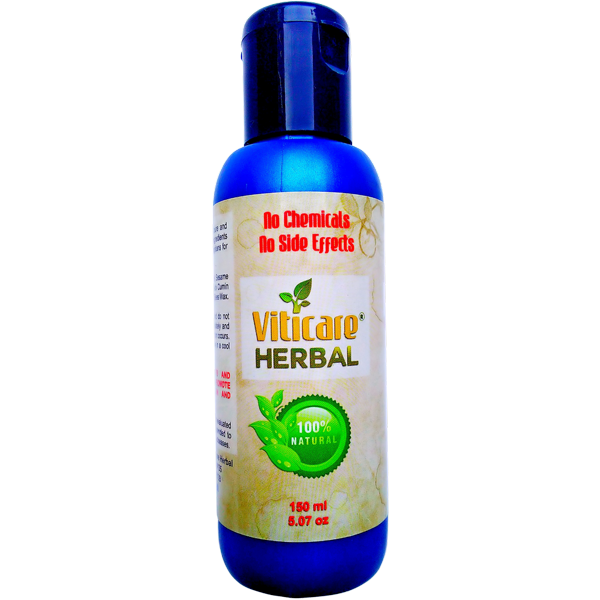 Viticare is an herbal formulation that comes in 5.7 OZ bottles loaded with essential oils and natural extracts. This natural remedy for vitiligo is said to improve the appearance of the skin caused due to Vitiligo. It includes pure essential oils like bee wax, bergamot oil and other natural oils. This herbal vitiligo treatment lotion is perfect for all skin conditions and suitable for all skin types as it is 100% natural. Note that there is no absolute cure for Vitiligo. Vitiligo is a type of skin pigmentation which leaves permanent patches on the skin. This is more visible on people with darker skin and it slowly spreads to other parts over the time. It may affect the skin, eyes and hair colour gradually. Viticare herbal vitiligo treatment is a simple natural lotion that can help to improve skin pigmentation problems and give a better appearance to your skin. It is free from chemicals and totally safe to use. Using this product will help you to recover from white patches and pigmentation problems in a natural way with long lasting effects. There is no particular answer to this question but there are certain findings that suggest that it is cause due to autoimmune conditions. This is caused when the body’s immune system destroys the cells that are responsible for pigmentation of the skin. When these pigment forming cells called as melanocytes die it directly results in white patches or loss of pigment in the skin. Herba-Care is a company that deals with natural products and herbal supplements. They have formulated their products after extensive travel and research around the world. Herba-Care have gathered a list of unique extracts to treat various conditions. The company uses organically manufactured plants to treat various medical conditions and they believe in treating ailments naturally. This herbal vitiligo treatment have combined various ancient remedies from various parts of the world into their products. Bees Wax is used to give the product a texture of a lotion. The ingredients used in this product are taken from traditional Egyptian medicine and has been used since centuries to treat skin problems. It helps to remove white skin patches by re-pigmenting the skin. According to herba care, viticare helps to prevent de-pigmentation of skin and re-induce pigmentation of the skin. Where Can I Buy Viticare? You can purchase viticare from Amazon.com or from their authorized dealers like Aramedia.com. Start applying viticare on affected areas and expose it to direct sunlight or ultra violet light if you live in areas where sunlight is not available. Do this daily for around 10 minutes to get better results. Within few months you can start noticing visible changes in those white patches. Your skin appearance will improve over the time. Since it is a complete natural product and does not contain any chemicals it is totally safe. It is free from side effects and really works as said. From the reviews what I understood is that this product has got a number of mixed reviews. There are people who say it worked for them and there are others who say that this product dint work. Majority of the people who gave their opinions stated that it helped them to improve the appearance of the skin. Some say that it works better on newly forming white patches than old ones. It helped to prevent further de-pigmentation of the skin. The other negative review which I found was that it takes time to show results. In terms of cost this product is priced high than other products of the similar category. But since it is a natural formulation and made of unique extracts the price is worth paying. Conclusion: Viticare does not cure the problem but it does help to contain the pigmentation problem and improve the affected areas. This is the only product that has shown effective results in patients suffering from Vitiligo. Being chemical and steroid free makes it a number one choice when compared to other products. Overall it has helped a lot of people to deal with skin pigmentation problems, leukoderma, and Vitiligo. This product is definitely worth a shot for the results it has to offer. Another alternative to this product is Callumae that prevents skin pigmentation naturally without any side effects.